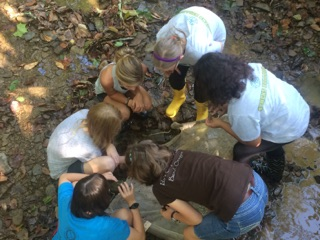 Athens SWCD offers a wide variety of environmental and agricultural education programs at no cost to any school, organization, or club in Athens County. Our classroom programs are designed to meet "Common Core" Academic Standards. They are age-appropriate, geared toward the needs of the audience, and flexible in program topic, program length and group size. Call our Education Coordinator at 740-797-9686 ext.6282 to see how we can accommodate you! What's On the Calendar? . . .
Are you looking to earn CEUs or College Credit this summer? Athens Soil and Water and the Ohio Division of Wildlife will be partnering with Ohio University to present Teaching Science from the WILD side: Wildlife, Aquatics, Birds, and Bees! All seminar participants will pay a $75 registration fee (due June 4), to cover meals, refreshments and educational materials. The fee includes 20 hours of CEUs contact credit. Make this check out to ‘Athens SWCD’. Please Note: CEU Books and materials are provided by the *ODNR, Division of Wildlife and the Athens SWCDs. Those wishing to receive the one hour, post graduate, non-degree college credit will register for the seminar as above but pay an additional tuition fee of $136. This check will be made out to ‘Ohio University Chillicothe’. The Ohio University credit application, registration, and fee can be completed at the seminar on the first day. Please Note: A list of graduate books will be supplied at registration. Participants will need a one day fishing license or greater which can be purchased on the first day. All hands-on activities are designed to meet or exceed the ODE standards for science education and the core curriculum. With nearly 30 bluebird boxes being monitored and reported on by area students, we have added a ‘Feeder Watch’ to make the program a year-round project. Using a Wildlife Mini Grant from Ohio Division of Wildlife, we were able to place five sunflower seed, thistle seed, and suet feeding stations at local schools. Students were given instruction in food selection and bird identification. They will monitor the feeders weekly and during the American Audubon’s ‘Great Backyard Bird Count’ in February, be able to report their observations to a nationwide citizen science effort. Every year our native birds are responsible for eating millions of unwanted insects around our homes and gardens. Loss of habitat, and the over-use of pesticides has reduced their ability to thrive. In an effort to promote these beneficial residence and teach field investigation methods and citizen science, the Athens SWCD is inviting teachers and students in Athens County to become part of the Books and Bird NOTES program. If you are interested in participating, contact our education coordinator for more information on how to apply for the program. Any Athens County High School student that will graduate in 2019 and is planning to attend college and major in agriculture or natural resources is encouraged to download and apply for the $500 scholarship offered through this office. Athens SWCD College Scholarship (open to any 2019 graduate of an Athens County High School) Applications are due by the end of the business day on March 29th. The 2019 Rules and Entry Form for the 11th Annual All Athens County Photo Contest are now available. Download and print your copy today. This year's photo entry deadline is July 15, 2019. We look forward to your photos of the natural or cultural beauty of Athens County. NOTE: Top county entry will receive $50.00. The county winner and 12 honorable mention photos will be made into an All Athens County Calendar for 2019. 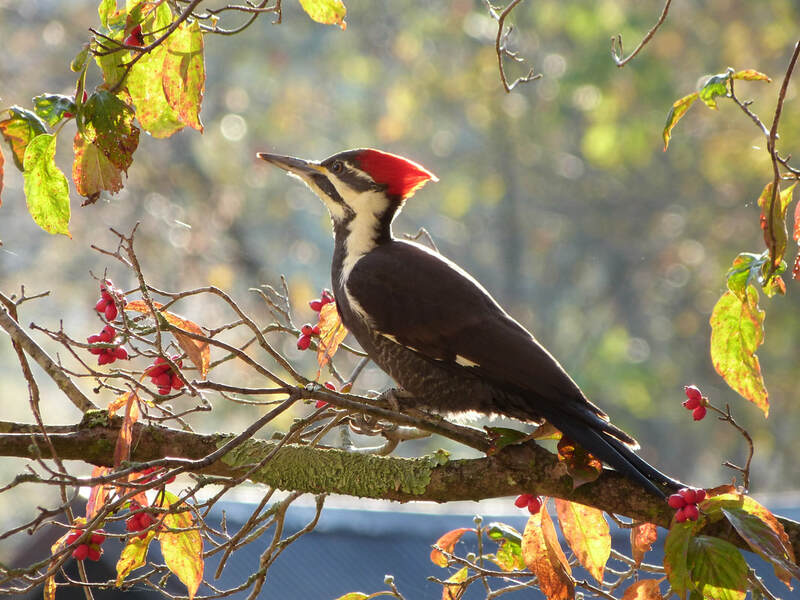 2018 Winning Photo 'Pileated Woodpecker in a Dogwood Tree"
Landforms and wind, water and ice erosion is the basis of a series of experiments that 4th grade students will experience with this hands-on program. We will provide for your classroom, all equipment , lab sheets, and instruction. Designed to meet or exceed the Ohio Core Curriculum for this grade level, your students will have an opportunity to set-up and experiment to see the creation of many landforms first hand. Their observations will have them making proper conclusions regarding ‘cause and effect’ under various erosion conditions. Call today to set-up an appointment to bring this to your classroom. NEW ’Knowing and Building Better Soils: A Pilot Project’ Takes Shape at Morrison-Gordon Elementary! 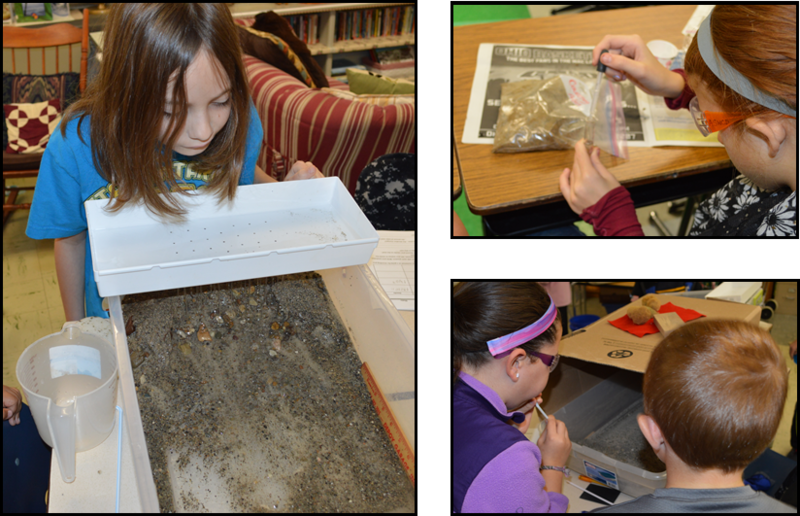 The recent acquisition of an AEP Foundation Grant for Environmental Education has made it possible to create a ‘Pilot Soil Health/Building’ program for 6th Graders. The Morrison –Gordon 6th graders are the first to experience this new pilot program in their classroom and school garden. When the program is completed, the 6th graders will have a knowledge of soil formation and horizons as well as the three features of soils: the Structure, through soil texturing, the Chemistry, through classroom testing and the Biology of soils, with an evaluation of the living organisms present in their school garden soils. They will make decisions on the health needs of the soils, if any, to successfully grow a garden crop and pollinator garden. They will make amendments using their new found knowledge. Give us a call and let us bring this very new program to your classroom. Recent field explorations found local students on a scientific field trip to Strouds Run State Park. They were asked the question: “Is this stream healthy?” Through the use of scientific method they explored the health of the stream by making physical, chemical and biological tests and observations of the area. They recorded their findings and drew conclusions based on those results. We would like to thank the Athens Foundation for their gift of grant monies to make the testing materials available to these students. Let us bring these program experiences to your classroom! Contact Athens SWCD for details.
. . . for a better tomorrow. 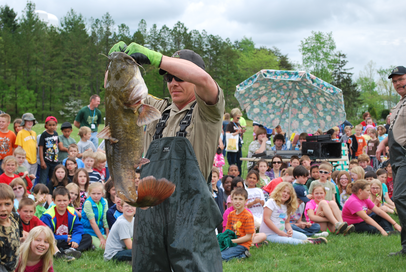 We offer a myriad of hands-on, fun and interactive programs for any age. Our education coordinator will work with you to provide a program, either indoors or out, that best suits your curriculum's objectives and your students' needs. The following is just a sample of the possible classroom and field programs that are available by grade level. Click here for a copy of the Conservation Education Brochure. Beyond these programs we also have staff experienced in Living Ohio History, Trees, Birds, Wildflowers, and Wildlife Identification and Programming. Field Trips and Land Lab Development . . . There is no better way to meet your learning objectives than through outdoor exploration, either in your schoolyard or at a stream in a nearby park. NOTE: Many field and classroom programs and topics can be tailored to fit other grade levels. We have field equipment to take your classroom to the field including soil testing, erosion pans, insect nets, aquatic dip and seining nets. Thanks to a 2014 grant from the Athens Foundation, we now have a portable field lab with microscopes, sorting pans, and testing kits to give your students the full field investigation experience. Let us assist with planning your field trips, or developing an outdoor learning area on your school grounds, which can qualify for a WILD School Site or a PLT 'Green Team' project certificate. Call us! Educator Workshops . . .
Project WILD Note the Aquatic Wild Manual is NEW! Are you in need of a resource to borrow for your classroom? We have an educator's Resource Loaning Library. ... and many additional education resources. Stop in and see what we can lend to you!